Conference rooms and meeting areas have become important sources for collaboration. Conference tables must be equipped to support productive teamwork, impromptu exchanges, casual chatter, interdepartmental brainstorming sessions, and project room all-nighters. Our emergent collaborative culture demands environments that support digital tools and shared work in open and enclosed spaces strategically located throughout the work place. Miro conference tables offer a modern, sustainable, and tech-ready line of tables and storage components designed to keep teams plugged in, while delivering a purposeful environment for workspace collaboration. Miro Conference offers a modern, sustainable, and tech-ready line of tables and storage components designed to keep teams plugged in, while delivering a purposeful environment for workspace collaboration. Miro Conference offers a modern, sustainable, and tech-ready line of tables and storage components designed to keep teams plugged in, while delivering a purposeful environment for workspace collaboration. Watson Miro Conference Table - 6' x 36"
Watson Miro Conference Table - 60" x 30"
Watson Miro Conference Table - 7' x 42"
Watson Miro Conference Table - 8' x 36"
Watson Miro Conference Table - 8' x 48"
Miro Conference room furniture offers a modern, sustainable, and tech-ready line of tables and storage components designed to keep teams plugged in, while delivering a purposeful environment for workspace collaboration. 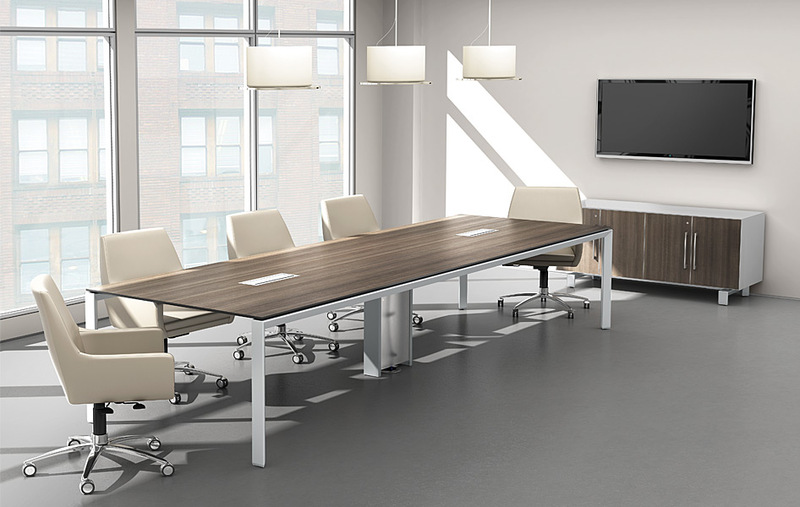 Miro Conference room furniture offers a modern, sustainable, and tech-ready line of tables and storage components designed to keep teams plugged in, while delivering a purposeful environment for workspace collaboration. MIRO tables are shaped from double-refined, medium density fiberboard and finished with high pressure, commercial-grade laminates. The edges of the 1 1/4-inch surface are profiled with a sweeping chamfer into which bases are recessed. The thin, exposed profile and floating effect creates visual lightness atop the robust, steel foundation. The angular geometric MIRO base is formed from 14 gauge, triangular steel tube elegantly mitred at the corners and fixed to the worksurface using concealed steel brackets. MIRO Leg Tube - The triangular MIRO Leg tube is .083 inch thick, induction welded, cold rolled steel, mill-formed on a progressive die line from coiled 14 gauge sheet steel. MIRO Bridge Legs - MIRO Bridge legs are formed from tube that is CNC miter cut and TIG welded at twin 45 degree joints. Two identical brake-formed, 12 gauge, cold rolled sheet steel brackets use a channel structure for rigidity. MIRO Single Legs - MIRO single legs (used at the corners of Verve tables) are made from triangular MIRO tube. The mounting plate is formed from 12 gauge, cold rolled sheet steel that is perimeter MIG welded from the top, hiding the weld for cleaner appearance and a stronger seam. MIRO Foot - The cast aluminum MIRO foot is mechanically secured to the MIRO leg tube. A leveling glide is threaded into the foot for a maximum 1 inch height adjustment. A hexagonal head is molded into the glide to allow for in-position leveling. Materials - MIRO worksurfaces are approximately 1 1/4-inch thick and are composed of synthetic laminate and backing material bonded to a 1 1/8- inch MDF (medium density fiberboard) board. The MDF is double refined for strength and a uniform finish. Worksurfaces - that have open spans in excess of 48 inches include heavy gauge steel reinforcement to reduce deflection. Metal-to-Metal Connections - Legs are fastened to desk surfaces with machine screws threaded into metal inserts at multiple locations. Integrated Snap Clip Slots - All MIRO worksurfaces feature embedded snap clip slots that accept proprietary Snap Clips (sold separately). Grommets - Factory installed grommets are available for all shapes. Angles have one grommet toward the 28 inch end. Rectangles and Wedges, 60 inches and under in length, have one grommet located toward the middle of the length. All other shapes have two grommets. Edges - The MIRO edge is shaped by a custom profiled CNC cutting head that exposes the MDF substrate. The profile is hand finished with water-based clear coat or stain. Dimensioning - Actual MIRO worksurface dimensions (length & width) are 1/2-inch shorter than stated. Watson Desking is a nationally-distributed US manufacturer of European-inspired office furnishings. Watson offers a broad range of modular, free-standing products that embody the principles of adjustability, space-efficient shapes, and design for emergent technologies. Utilizing materials with high recycled content and low emissions, Watson Desking provides furniture solutions that can help customers meet their own environmental initiatives, including LEED certification. CONSTRUCTION WASTE MANAGEMENT - Watson Desking products are protected during shipping with reusable blankets and wood pallets that are either returned to the factory or retained by the delivery company. This diverts construction debris from the project site, and allows the packaging to either be recycled or reused by the manufacturer. REGIONAL MATERIALS - Projects within 500 miles from our manufacturing facility in Poulsbo, WA, benefit from our location and use of regionally sourced materials. RAPIDLY RENEWABLE MATERIALS - The Watson Studio design modification process can be used to specify core and surface materials meeting the 10 year maximum harvest cycle for this credit. CERTIFIED WOOD - All Watson Desking board suppliers participate in the Sustainable Forestry Initiative (SFI), as well as provide material certified by the Forest Stewardship Council (FSC). LEED projects seeking this credit can specify FSC certified core material through our Studio design process. INNOVATION IN DESIGN - Up to three LEED points can be earned for providing exceptional performance above LEED credit standards. Customers using the Watson Studio design modification process can specify products and materials that meet the design intent for this credit area. REGIONAL PRIORITY CREDITS - LEED 2009 introduced this new area with the intent to highlight geographically important issues. These credits are not new, but rather existing credits within the rating systems and are specific to a projectÍs location, based on zip code (see usgbc.org). Projects earning any 4 of the 6 specified credits (1 bonus point each) can receive a total maximum of 4 points in this area.